Week 20. And there were tomatoes in the box. Also, edamame. Oh yeah, tatsoi. Cilantro. Talk about mixing cultures! It’s one of the reasons I like this CSA so much. The adventure. The variety. The fact that Lancaster Farm Fresh uses a tightly knit group of farmers to supply thousands of people in the New York and Philly areas, as well as New Jersey, Delaware, Maryland and DC. They use a rough 150 mile radius for their membership. To me, that diversity of New York and Philly, along with their wholesale business which I assume caters to restaurants and large produce and farm stands, is what drives them to grow such unique items. Today the fruit share members had Asian pears, concord grapes and kiwiberries in their share. I really wished we had chosen a fruit share seeing their bounty. Today also the half share members had Asian green radishes. Heirlooms. I should have waited around to try and swap for some, but I was loving our haul, and still had those blue radishes from last week. I ended up roasting them this afternoon, with the mixed beets and the remainder of the purple okra I picked up from the Glenwood market last Saturday. I was multi-tasking here. Roasting beets. Dry roasted over salt. Okra and radishes were both drizzled with oil. The radishes ended up in tonight’s stir fry. 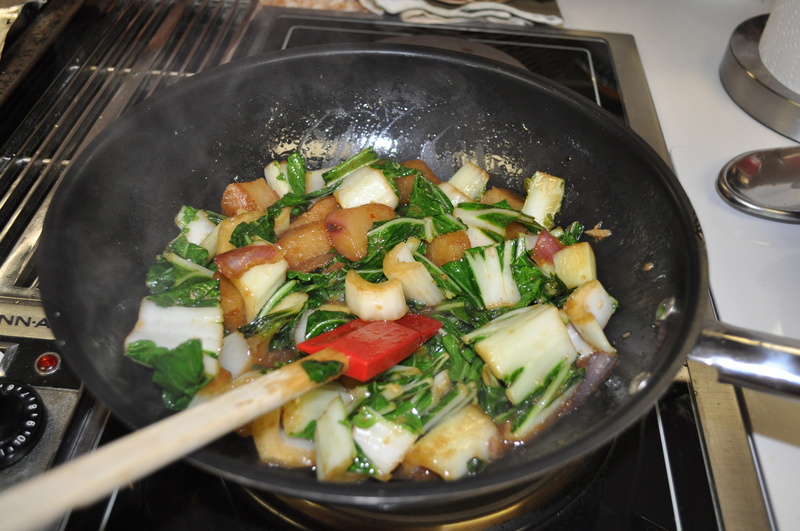 Last week’s bok choy, onion, garlic, ginger, soy sauce and the radishes. A splash of sesame oil. Served with chicken. Definitely not boring meals in our house. The CSA always surprises us. Posted in CSA, Farms, Food, Locavore, Real Food and tagged cooking, CSA, farms, Food, foodie, Locavore, real food, value of CSA. Bookmark the permalink. 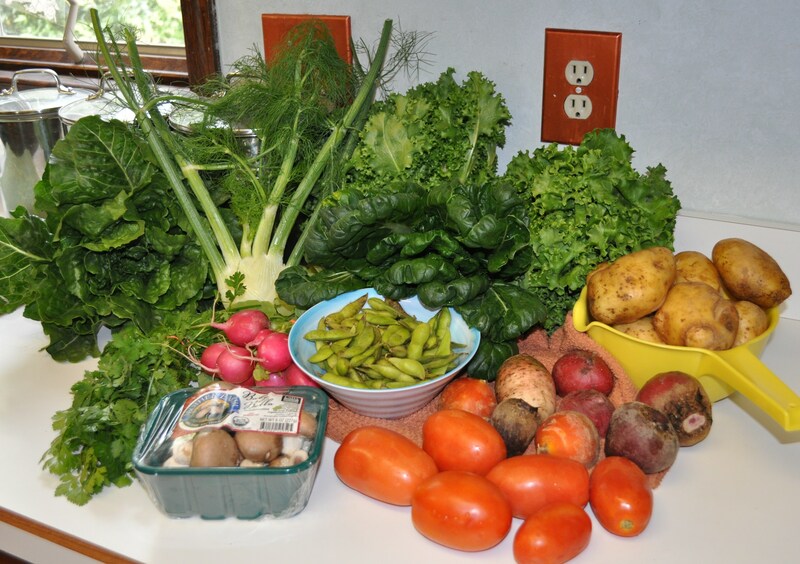 This week’s share from One Straw Farm contained: kale, swiss chard, bok choy, green peppers, lettuce, sweet potatoes, potatoes, and beets (choice of colors) with greens. I was not a fan of the green radishes. Definitely more bite than I anticipated, and I do love radishes. Cooked, they got a bit bitter. Pretty, and worth a try though. That’s what I love about CSA’s , we get things we might not try if we saw them in a store. 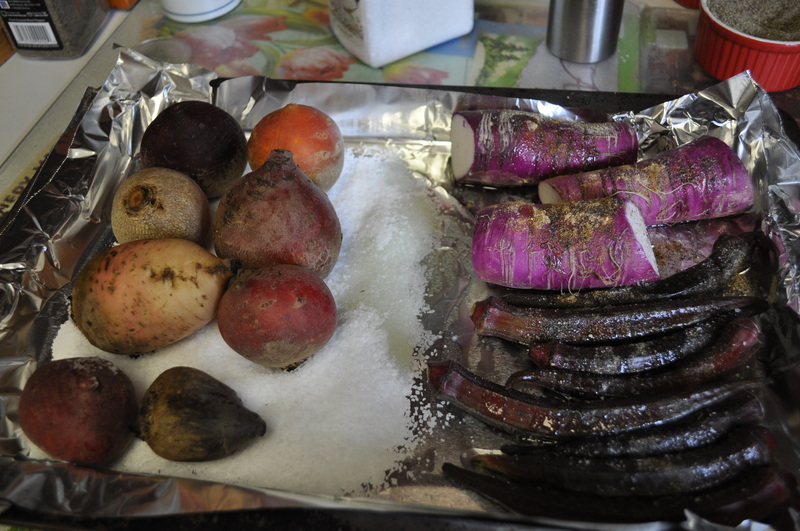 I have never seen that method of roasting beets before…a must try!